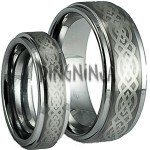 As with all Ring Ninja Tungsten Rings this set is going to last forever – and just to give you that peace of mind and protect you from buyers remorse, it comes with a 21 day exchange/return period, and after that a lifetime warranty will kick in – and that even covers rings that have been engraved. That’s a hard deal to beat in today’s world. Our 9MM and 6MM Laser Etched ‘Celtic’ Tungsten Wedding Ring set features a Celtic style pattern making it a very popular choice for his and her wedding bands, or just a standard piece of everyday jewelry. These comfort fit rings are made from Tungsten Carbide and are extremely scratch resistant. Their shine will last a lifetime.